Learn about electricity the fun way! The Magic School Bus meets The Way Things Work in this kid-friendly guide to understanding the basics of electricity, perfect for budding engineers. The Invention Hunters travel the globe in their flying museum collecting the world's greatest inventions! This time, they've landed in a kid's backyard, and these silly scientists think they've stumbled on incredible specimens, from umbrellas and lipsticks to coins and rockets. But what they really discover--with a kid as their guide--is how electricity and magnetism powers lamps, batteries, and even toasters! 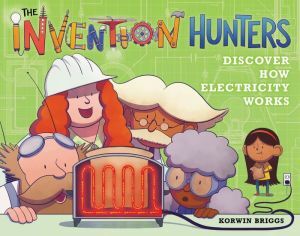 Using simple explanations and diagrams and a heaping helping of humor, the Invention Hunters make the perfect companions for curious kids who are ready to learn about science, physics, engineering, history, and more.